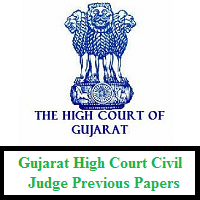 Download Gujarat High Court Civil Judge Previous Papers PDF from this page. And this page helps all the candidates who are ready to attempt the Prelims and Mains Exam. Furthermore, the officials of the Gujarat High Court had announced the exact date to conduct the test. And the Prelims Exam will be conducted on 5th May 2019 where are Mains exam is to be on 7th July 2019. So, check the below sections to get the details GHC Selection Process 2019, GHC CJ Exam Pattern 2019. Moreover, the links given GHC CJ Sample Papers with Solutions will let you know about the frequently repeated questions in the examination. All the applied and eligible candidates need to undergo the GHC Selection Process 2019. And there are three rounds in which the Gujarat High Court officials hire. All the selected candidates in the Preliminary test will only be promoted to the Mains Examination. Later on, they will have the Viva-Voce Test/ Oral Interview in the month of October/ November 2019. Candidates need to check the suitable GHC CJ Exam Pattern 2019 which is published by the officials. And you have to score more marks in the test so that you can attain the Civil Judge position. So, get a glance from the below tables and then start preparation. The Preliminary Examination (Elimination Test) will be given for 100 Marks. The time duration will be only 2 Hours, consisting of Multiple Choice Questions (MCQs) each of 1 mark with Negative Marking of 0.33 Mark for each Wrong/ Multiple Answer. When compared to the previous years, the officials of the Gujarat High Court members have tightened up the competition level. So, all the candidates need to download the Gujarat High Court Civil Judge Model Papers PDF. And as per the latest update, they will give more typical and logical questions in the GHC Civil Judge Written Exam 2019. So, definitely, the competition will be going sky high. Henceforth all the candidates need the perfect preparation to score more marks. We hope that all the candidates will soon start preparing for the exam by downloading the Gujarat High Court Civil Judge Previous Papers. So, do bookmark us on Freshers Now for the latest updates.